What makes a normal snack great? It is easy to make, fills you up, and doesn’t weigh you down, right? And how often have you suffered from hunger pangs in the middle of the night but you are just too lazy or simply not in the mood to slog in the kitchen for hours to make something to appease your appetite? We often crave for something to munch on in between meals, and these foods are most of the times taken quite lightly by most of us. We just pick up that bag of boring chips or other store-bought items that are often unhealthy. What if we tell you that we have prepared a pretty awesome munchie recipe for you that would hardly take 10 minutes of your time and is lip-smacking delicious as well! Of course, Insta-worthy, too! Today, we will be making everyone’s favorite: crispy chili potatoes! Nothing fancy but totally legen—wait for it—dary! You wouldn’t be able to stop at just a few bites. And you need not worry about calories; these crispy chili potatoes have been tweaked to add a healthy touch to them. So let’s get on with this simple, low-effort, but super-comforting food! Crispy chili potato is a very simple dish and can be easily made at home. This juicy, crispy, and appetizing snack is simply irresistible and finger-licking good! This munchie would definitely be your new favorite and go-to snack! Add chopped onions and capsicum. Add 3 tsp of chili sauce. Add 2 tsp of soy sauce. Sauté the vegetables for a couple of minutes. 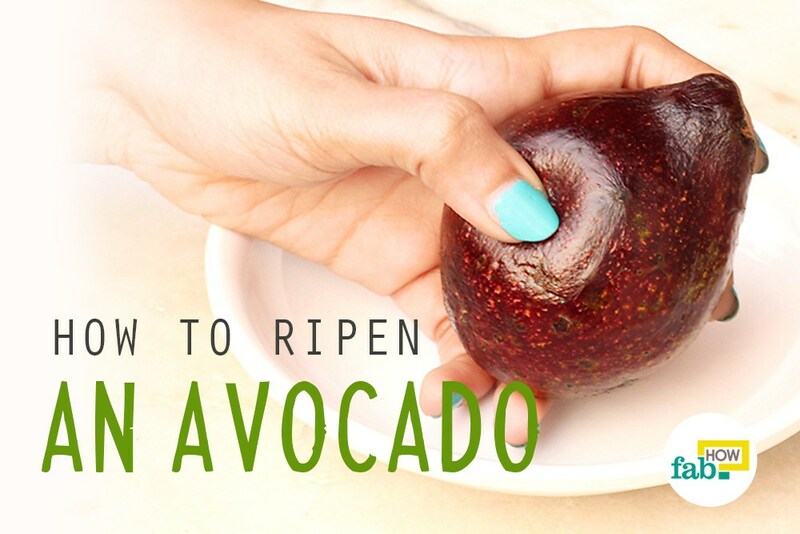 Add 1 tsp of ketchup. Add salt according to your taste preference. Add the French fries to the pan. Stir the vegetables and French fries for a minute or two. 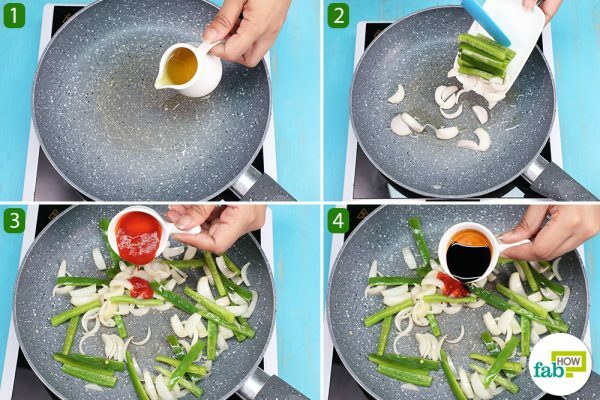 You can add more or less of the chili sauce, soy sauce, and ketchup to suit your taste buds. 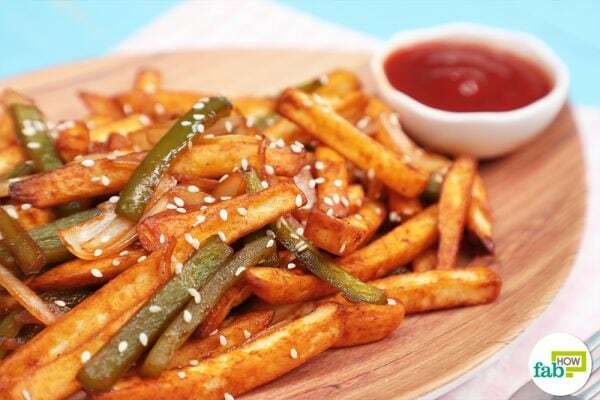 The French fries should be baked in an air fryer to make this snack healthy. Place the potatoes in the air fryer at 220 °C for 15 minutes to make crispy French fries. Don’t leave them in the air fryer for long; otherwise, they would lose their original texture, and you would get dark-colored French fries. Transfer the crispy chili potatoes into a plate. Sprinkle white sesame seeds over the crispy chili potatoes and serve it hot with a ketchup dip. Your 10-minute munchie is ready! Enjoy basking in praise from your friends and family as they munch on this delish snack. If you are not a fan of chili sauce, you may use sweet and spicy tomato sauce. You can also throw in some spring onions, chopped ginger, and minced garlic if you want to enhance the exotic flavor of your snack. For an intense flavor, you can add 1 tbsp of vinegar together with the other sauces. If you prefer your crispy chili potatoes in gravy, add cornflour paste to the vegetables. To make a cornflour paste, mix 2 tsp of corn flour to ¼ cup of water. Corn flour paste also makes the potatoes crispier. You can tweak this crispy chili potato snack slightly and make honey chili potatoes. To make honey chili potatoes, add 2 tbsp of honey to the vegetables together with the other sauces. If you do not have an air fryer, you can always do it the old-fashioned way and deep-fry the French fries. But it’s better to bake or air-fry them for a healthy snack. 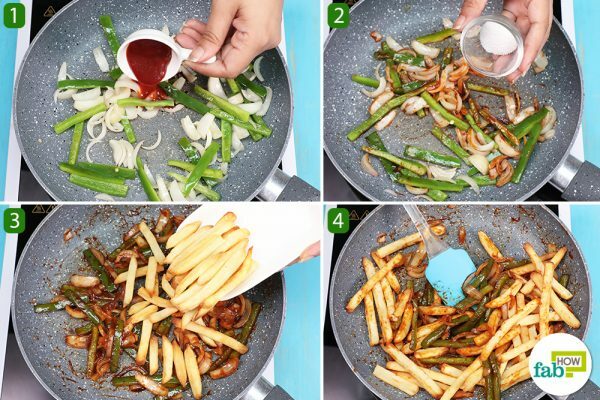 You can also make French fries from scratch at home. To make homemade French fries, wash and peel your potatoes. Slice the potatoes into sticks and place them in cold water so that they don’t turn brown. 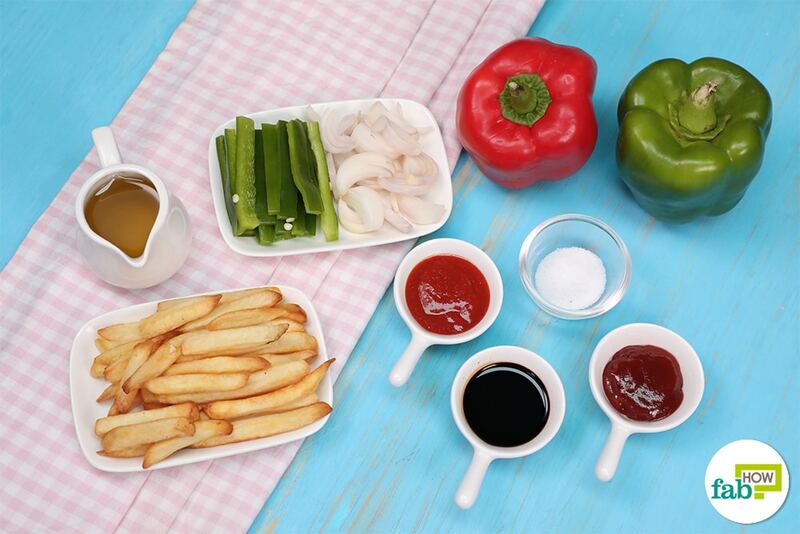 Soak them for 20 minutes; this step gets rid of excess starch, resulting in fluffier and crispier fries. Remove the potatoes from the water, and drain and dry them. Heat oil in a pan over medium heat, and fry the potatoes in batches not to crowd the pan. Keep stirring them so that they are cooked uniformly. Remove them once they get crispy. Frying for longer would leave you with brown French fries. Stack them on a try and let them cool down. Now, increase the heat of the oil to medium-high or high and put in the half-fried potatoes again. Fry them until you get golden and crispy French fries. Take the French fries out of the pan, and remove excess oil using a paper towel or tissue. You can sprinkle some dried herbs, paprika, salt, and red chili flakes to enhance the flavor of your French fries. You can replace the French fries in this recipe with cottage cheese. The entire process would be the same. All you have to do is medium-fry the cottage cheese in a separate pan before adding it to the sautéed vegetables. To add more crunch to your crispy chili potatoes, you can throw in some fried peanuts. If you want a dish with a bit more panache, add pieces of boneless chicken to the pan while stirring the vegetables. You can separately fry the boneless pieces of chicken before adding them to the pan of crispy chili potatoes. You can also use potato bites in place of French fries for this snack. If you are not in the mood to chop vegetables, you can always purchase packaged pre-chopped vegetables that are available in the market. You can also enjoy authentic Japanese prawn tempura at home along with some vegetables and dipping sauce without much hassle. If you are craving something Spanish, you can easily make classic Spanish ham croquettes at home.